On a snowy Friday night with weather projections for the coming hours looking grim, the Blue Horizon never hesitated about going on with their scheduled show. And it turned out to be the right thing. The fights were sizzling, and the weather, although intense, really only started to get worse after show ended. Amazingly, a healthy crowd of die-hards came out to watch the fights on this night when it seemed crazy to be anywhere but home. But those who ventured out were rewarded with good fights and an earlier-than-usual exit, thanks to numerous knockouts, and an uncharacteristically brief speech by promoter Vernoca Michael, which really helped to move the proceedings on to a prompt finish. In the main event, Germantown's USBA junior middleweight champ Derek Ennis, 154 pounds, clashed with Puerto Rican journeyman Edwin Vasquez, 150, in an 8-round non-title bout. Derek jumped out to an early lead, having his way with the action. However in round three, Vasquez popped Ennis with a solid punch that changed the course of the fight, but it did not change the momentum of the fight. It help to channel it toward the end. Ennis reacted to the punch that landed on his kisser by immediately going to the body of Vasquez. It worked. The shots downstairs hurt Vasquez. His body sagged momentarily, but then he too answered back. The two went to war. Ennis stayed out in front, but he couldn't end it. Near the end of the third, he again hit Vasquez in the stomach and once again, Vasquez was hurt. Before Derek could try for the finish, the bell ended the round. Ennis picked things up in the fourth, but focused his attack on the head. Not much happened. Then as the round wore on, Ennis returned to the body and hurt Vasquez again. But the round was over, and Ennis missed another chance to go home early. The message finally came through between rounds and when the fifth session began, Ennis came out with his sights set on Vasquez' mid-section. It paid off. The game visitor could not take the punishment. He went down twice from body blows. The second time, he withered, slowly bowing to his left side and onto the canvas. Vasquez shook his head "No" and his corner attempted to signal surrender. 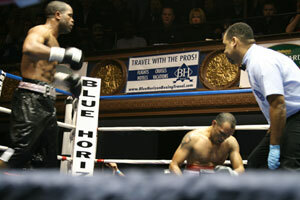 But Referee Shawn Clark didn't see the plea of the trainer, and made his own decision to halt the bout at 1:26. The win raised Ennis' record to 20-2-1 with 13 KOs. This fight couldn't touch his last outing (a thrilling, high-level victory over Eromosele Albert to gain the USBA belt), but once again Ennis found himself in a crowd-pleasing battle. Even though he won every round, the action went both ways and entertained all the way. Vasquez fell to 22-15-2 with 8 KOs. In a six-round co-feature that came after the main event and at the end of this snowy night, featherweight Eric Hunter made short work of his opponent, Robert Bonilla, but the Nicaraguan must be given an assist on this one. Hunter came out for round one looking as serious as ever. He circled and flashed his showy punches from every angle. Bonilla kept his hands high, plodded forward and took punches. Suddenly Hunter cracked Bonilla with a left to the ribs. Bonilla took a step back and went down to one knee, presumably to catch his breath. 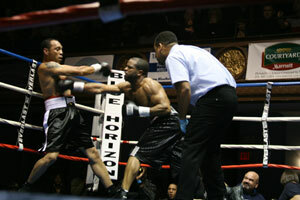 Referee Benji Esteves, Jr. started the count. Vasquez looked ready to pop up, but never did, and just like that, the fight was over. Did he quit? Did he lose the count? Was he, like everyone else, worried about the snow? In any case, the count reached ten and the fight and night were both over. Who could argue in all this weather. The time was 3:00 of round one. Hunter, 125, improved to 12-1 with 5 KOs. For the increasingly inactive Hunter, this quickie didn't do him much good. 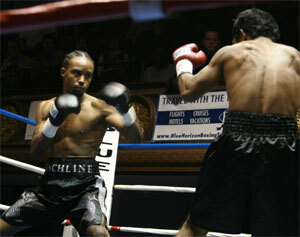 Bonilla, 124, fell to 22-12 with 13 KOs. In another six-rounder, which went on just before the Ennis fight, rising Ronald Cruz (7-0 / 4 KO) faced wily old vet Martinus Clay (13-24-4 / 5 KO). Although Cruz has looked golden in his brief run thus far, many thought this match was a dangerous one. After all, Clay is a battle-tested fighter who is no stranger to upsets. But the worries proved unfounded. Clay, 148.5, came out strongly in the first and did plenty to win the round. But Cruz, 147.5, picked up his pace in the second. When he began punishing Clay with body shots, the fight turned in his favor. Quickly, Clay began to look tired. A far-away look came over him and the die was cast. In the corner, Clay looked like a beaten fighter. He proved it in round three. Cruz backed Clay up with a variety of shots before a booming uppercut dropped him heavily on the canvas. Clay struggled to get up, and Referee Esteves stopped it at 1:57 of the third. So for Cruz, Martinus Clay turned out to be the right opponent at the right time. Clay, always tough and always competitive, may be ready to call it a career. He appeared to be in great condition going in, but he lost his confidence and took on the "opponent persona" once the serious punches started coming. Gaining his 8th win and 5th knockout, Cruz looked better than ever. "Jamaican Sensation" Jackie Davis, 146.5, and Melisenda Perez, 149, waged a wild and entertaining scrap in their four-round bout. Both women traded shots and waged a two-way battle that brought a standing ovation after round three. 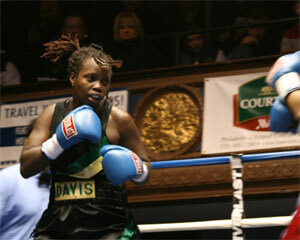 Perez used an effective uppercut, while Davis used her energy and forward motion to force the action. Once the fight was over, announcer Larry Tournambe called it an early candidate for fight of the year. The judges all saw it for Davis with scores of 40-36-, 39-37 & 40.36. There was no doubt that Davis had won it, but the scores did not reflect the closeness of each individual round. In perhaps the most anticipated bout on the card, local heavyweight Joey Dawejko made his hometown debut, and ran his pro record to 2-0. 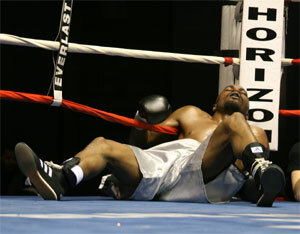 His opponent was Ricardo Johnson of Ohio (1-0), who put up little fight once Dawejko's punches started to fly. 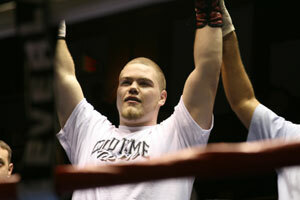 Dawejko slammed a noisy right-handed body shot early in the bout that landed with a loud crack. The force of the blow separated Johnson from his desire to shock the Tacony amateur, still just 19. 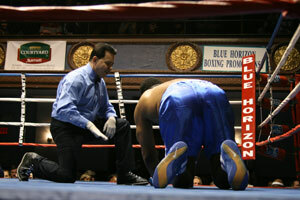 He went down on one knee and took the full 10-count from referee Shawn Clark. After the bout, Dawejko said that he "didn't think it would be that easy". It is certain that Johnson, never imagined it would be so hard. Swedish heavyweight Andreas Gustafsson came a long way for his scheduled four-rounder, but he made the trip worth it by scoring a knockout victory over Levay King. The 29 year old got a late start to his boxing career, given his country's long-time ban of the sport. But boxing's relatively recent return to the land of Ingmar Johansson allowed Gustafsson to finally chase his dream of being a pro fighter, and leave behind his status as a boxing Ingmar Bergman. It seems Gustafsson has filled his time by completing three documentary films in recent years. In this his fourth pro start, Gustafsson went right to Levay King. 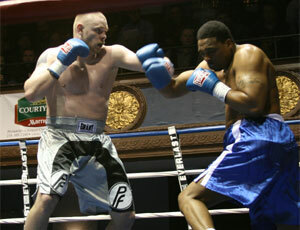 Using a switch-hitting stance, the Swede whacked away at King, hurting him in the first and flooring him in the second. Referee Esteves stopped the fight at the end of the second round (3:00). 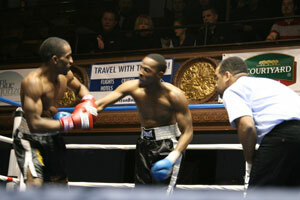 The evening started with a four-round junior welterweight match that pitted debuting Clement Bethea (at left in red gloves) against Henry Northan (blue gloves). 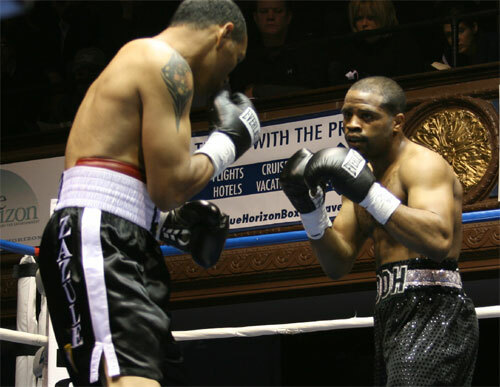 It was listed on the bout sheet that Northan was also making his professional debut, but BoxRec had him as 0-1, from a fight dating back to 2003. Henry stormed out to take the first round, but Bethea rebounded to win the remainder of the fight with greater punching power. Bethea bloodied Northam's nose in the third. Still it was a competitive fight. 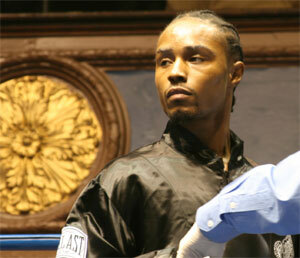 The decision of the judges was split, 39-36 for Northan and 39-37 twice for Bethea. There was one last minute scratch on the card. Cruiserweights Tim Johnson and Charles Hayward were supposed to clash in an interesting scheduled four rounder, but something happened to Johnson. Hayward was backstage and later sitting at ringside, but there was no sign of Tim Johnson. It does not appear that he weighed in the morning of the fight. So perhaps the cancellation wasn't as last minute as it seemed.